Last week we began our discussion on trains and without much argument it was decided that “Yes Virginia there are No Trains to Heaven, but there is a Stairway to Heaven”. Being that we have can not think of any songs that say that there is a stairway to hell maybe it’s time to decide if there is a Highway to Hell or do we all just get on a Hellbound Train? 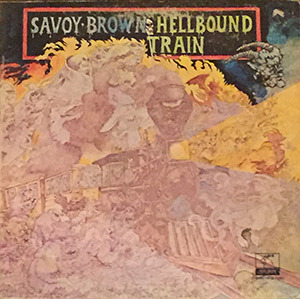 We here at Forgotten Rock Classics would like to make a case for Kim Simmonds and Savoy Brown having the right idea about it being a train and not a highway that some of us might end up traveling down if we end up going to hell instead of the Elysium Fields. AC/DC are heavy metal rock legends and Highway to Hell is one of their all time greatest hits. This song gets radio play, played on television shows as well as movies but one can only listen to it so much like most of their songs then your done. At some point hearing the same three notes over and over for three minutes is just to much. This brings us to Savoy Brown and Hellbound Train. In 1971 they gave us Street Corner Talking with their biggest and maybe only radio play hit Tell Mama. For the follow up album in 1972 Kim Simmonds and the band gave us Hellbound Train, with no radio play, never used on television shows or movies. This would make us say that their must only be a Highway to Hell. For all the misery that hell is suppose to be, do you think that we would be able to just simply travel down the highway for 3 minutes 2o seconds or would the devil make it last longer like 9 minutes and some change. Heavy metal is all about the dress and banging music but when you watch and listen to stories about “The Crossroads” what music is always playing? Blues guitar! When your lead guitarist has been compared to the legend Rory Gallagher, and can play some of the best blues guitar on the planet, the table starts to lean heavily towards there being a train going down versus traveling down the highway. Hellbound Train begins slow and runs that way with but a minor speed change for the first 5 plus minutes, but it allows all the band members to enjoy the spotlight without losing any of the quality of the song. With the late Dave Bidwell’s symbols keeping the time we get a heavy dose of Paul Raymond’s organ. Paul’s biggest claim to fame came after he left the band and joined UFO. Dave Walker voice fits in so well with the mood and tone of the song during this slow time and helps build the song up. Walker’s voice picks up around the 5:30 mark and the band members follow suit. The biggest surprise is for a song from the early 70’s we get way past the 6 minute mark and you haven’t heard from Kim Simmonds but that is soon to change. For the rest of the song Kim leads the band through this guitar blazing jam session that comes to a MAJOR halting end that will catch you off guard the first time that you hear the song. But by far makes up the final reason for why it’s a ride on the Hellbound Train that takes you to your abrupt ending in hell. This entry was posted in Blues/Rock, Forgotten Rock Classics, Forgotten Songs, Hellbound Train, Kim Simmonds, Music, Rock Band, Savoy Brown and tagged Classic Rock, CS5711, Forgotten Rock Classics, Forgotten Songs, Hellbound Train, Kim Simmonds, Music, Record, Rock Music, Savoy Brown, Song. Bookmark the permalink.